Don’t risk your site development or current landscaping by trusting just anyone claiming they can dig a trench. We can trench a variety of widths and depths. We only trench out what is necessary and get in and out quickly to complete your project. 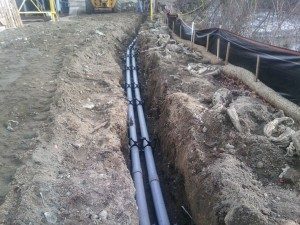 At Mike Lynch Enterprises, we have all the proper equipment and trained, licensed professionals needed to quickly and efficiently permit, design, and dig any required trenching for your project, large or small. In addition to trenching services, we also pull pipe and install silt fencing and wattle sox for site erosion control and regulatory compliance.